Being interviewed about his process of creating the hunchbacked Richard III for the 2012 Bridge Project production he took around the world, Kevin Spacey talked a lot about the physicality of the character, the psychology, and then said that, ultimately, "I just let the play take me." Unfortunately, "NOW: In the Wings on a World Stage," the Jeremy Whelehan-directed documentary about the "Richard III" production, doesn't do the same thing. The play is not allowed to take us anywhere; the documentary is more interested in the experience of the actors and what it was like for them to work with Kevin Spacey and tour the world. "Istanbul is so exotic," is one reaction from a young actor, and that's about as good as the commentary gets. The disjointed, flighty structure, including backstage "confessionals," makes the documentary feel like an extended episode of MTV's "Road Rules," with only occasionally tantalizing glimpses of the actual production. Scenes are not allowed to play out in full, and there is often voiceover placed over the scenes, where actors reminisce about what it was like working on the scene in question. The end result is confusing and frustrating. Al Pacino's "Looking For Richard" grappled with the great challenge of the play itself, and that monster of a lead role. "NOW: In the Wings of a World Stage" feels self-congratulatory in comparison, a cast sharing its fun photo album of a year-long vacation in "exotic" locations. The Bridge Project was the brainchild of Kevin Spacey and Sam Mendes, a partnership between BAM, the Old Vic, and Mendes' production company Neal Street, devoted to bringing productions of classic plays to audiences around the world, using a cast of both American and English actors. Due to union rules, this sort of cross-national-pollination in casting is rare, and Mendes said, "The idea behind The Bridge Project was born out of a simple desire: a wish for artists, collaborators, and audiences on both sides of the Atlantic to experience one another's work, talent, and artistry in the theater." The Bridge Project started off with two 2009 productions, Shakespeare's "Winter's Tale" and Chekhov's "The Cherry Orchard". 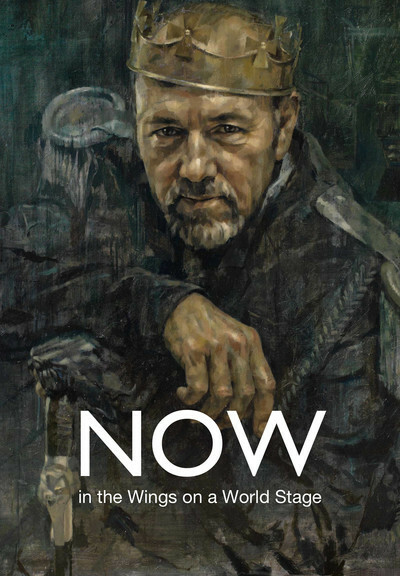 Two more productions followed, and in 2012, the Bridge Project's final production was "Richard III," starring Kevin Spacey in the lead role. They toured the world with "Richard III," taking it to Turkey, Italy, China, Greece, etc. "NOW" introduces us to the cast. There are American actors, some of whom have never done Shakespeare before. There are British actors, some damn-near legendary, like Gemma Jones. The American actors discuss being intimidated by the British actors and their facility with language, and part of the Bridge Project's mission was to try to blend the two traditions. We are shown some of the rehearsal process, although not enough of it. Instead, we are subjected to long scenes watching the cast surf down sand dunes in Dubai and talk about what a great experience it was for them as a group. It feels like sitting at a table with a bunch of people who were all just on vacation together and want to show you 500 photos of the amazing time they just had. The journey one must take during that scene is a daunting challenge for any actress. Scholey talks in-depth about her approach and how she and Spacey cracked it in rehearsal. But again, frustratingly, we are never allowed to see the end result play out in full. We get only glimpses. The documentary seems to think we are more interested in seeing the cast take pictures of each other on the Great Wall of China and talking about how much they miss their families back home than doing the actual show. Richard III is one of the largest lead roles Shakespeare ever wrote. The character is rarely off-stage. There is the physical challenge of creating the man's disabilities. Actors have ruined their backs, sometimes permanently, while doing a long run of "Richard III." Antony Sher, in his wonderful book "Year of the King," which details his process creating the role for the 1984 Royal Shakespeare Company production, talked about how he worked with a physical therapist in preparation for the run. Spacey's comments on the character of Richard III are somewhat interesting, especially the bit about how once Richard puts the crown on his head, everything changes. Up until then, he has been a delightful villain, commiserating with the audience, cackling in glee (Richard is quite funny). Once he actually gets what he wants—the crown—the only thing left to do is protect his power at all costs. There is a great moment in the play which everyone referred to as "The Qaddafi Entrance," where Spacey, wearing dark sunglasses, a rakish crown, and a military uniform emblazoned with medals and wide epaulets, staggers onstage surrounded by an entourage of bodyguards, with martial drum-rolls accompanying the entrance. It looked thrilling. It would have been nice to see more of it.